What happens when you book your photo session with Second Look Photography? After a short consultation to find out what style you are looking for and if you have any ideas, we’ll offer advice based on our experience. On the day we will combine several different poses, with or without props with the background/s of your choice. We take enough different images so that you have plenty to choose from. Sessions can last from 15 mins to 3 hrs depending on what you want and how well children or pets interact. We will give you an idea of how long a session to book based on number of people and ages involved. Usually we can say that a couple of children would take half an hour, a small family with extra pics of kids together and separate, an hour. We offer FREE photo sessions of up to an hour. You might wonder why, as most photographers will charge for their time for an hour session. Well, this is because we are so confident that we will be able to provide you with images that you will love, that we are sure you will buy some. Having said that, there is no obligation to buy anything, sometimes if a child is tired or unwell things don’t always go to plan. There is no extra charge for ‘out of hours’ shoots either. What times can I book in. We work daytime, evenings and weekends to suit our clients. Our normal opening hours in the studio or on location are form 10.00 am till after 5.00 pm but we will swap our working hours to suit you, After all it can be hard to get families all together for a shoot at all without extra constraints from us. Because we are full time photographers we can spread our photoshoots throughout the week, so weekends are not too busy. This means that your session is not abruptly stopped just when your child is at their best because another client is due any minute. We try to be quite flexible where children are involved. We find that parents are much more relaxed without time constraints. Over the next few days, we will make a selection of your best images with some basic editing eg, white balance, contrast, cropping. 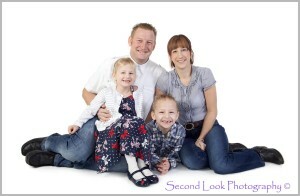 We will then arrange for you to come to our Ibstock studio near Coalville to view your images. Choose however many you like from one image to lots. Different size photographs are available as are a range of frames or wall products for your favourite images. Prices start from as little as £15.00 for a mounted print that is ready to display. We may advise you of different options but do not believe in pressurised selling ( we’d like you to recommend us to your friends and family!) . Once you’ve decided on your order we will put the final finishing touches to your images to make them (and you) look great and send them away to a professional lab. How long does it take for prints, canvas, frame, or other wall products to arrive? We normally say to allow a week after your photo session for prints and a couple of weeks for framed or wall products before they’re ready for you to collect them. This can vary if we are extremely busy. 07989 691770 Copyright Second Look Photography. All rights reserved. Unite Theme powered by WordPress.